A lot of smart people are creating mediocre or even bad online learning programs. But others are leading the charge into online learning 3.0. This article explains what online learning 3.0 is and how can your organization get there in a practical way. Creating mediocre or bad online learning programs doesn’t happen due to lack of effort. Lack of resources, budget, know-how, and ROI visibility are key reasons. Another reason is the ever-popular “negotiating to mediocrity” syndrome. But a few organizations are leading the charge into the next generation online learning 3.0 and it’s possible for any organization to be one of them. Harvard Business School has created one of the most advanced learning environments in the world. Boeing, NASA, and MIT are breaking new ground in lifelong learning. Fitch is leading the charge into an adaptive-powered world of corporate learning. These and a number of other examples represent the evolution of leading organizations to the next generation of training, online learning 3.0. But don’t let the brand names fool you. You don’t have to be a massive organization to create a modern online learning experience. But before we discuss exactly how to do that, let’s take a look how we got here and what online learning 3.0 means. When talent management and marketing departments first started using the internet, online learning meant a series of web pages, PDFs, and disjointed videos. They just pointed learners at a section of their intranet and let them have at it. This was online learning 1.0. Structure basically consisted of left-hand navigation menus. Learners were largely left to their own devices and there were no analytics. Over the past few years we’ve seen the rise of the Learning Management Systems, or LMSs. These enable courses with more structure than a section of the corporate intranet. They allow course creators to easily stand up a course online. MOOCs, an offshoot of this, have also taken off. Both take a traditional classroom approach. Lectures, in the form of videos, usually with multiple-choice assessments. The flow is linear. Again similar to classroom learning. These courses also include some rudimentary analytics mainly consisting of completion status and rates. While these online, “talking head” courses have allowed learning and development groups to expand their reach beyond physical classrooms and create more structure than a static intranet; they still aren’t a great way for people to learn. First and foremost, let’s be honest, they tend to be really, really boring. The fact that these courses remain really boring is a much larger problem than most learning and development managers realize. Traditionalists might say that is the price to be paid if you want to learn. “Learning takes work” is the common refrain. Tough luck kid, but I’m busy. However, just like the BYOD revolution that occurred with corporate phones, as people are increasingly exposed to better, more innovative consumer solutions outside of the organization, they will not put up with antiquated, inefficient, boring courses at work for much longer. Besides being boring, online learning 2.0 courses are not great at teaching real-world application. Talking head courses take a very generic approach. Due to the dependence on cookie-cutter, off-the-shelf Learning Management System software, organizations can’t easily tailor a digital experience to create a unique learning environment best suited for a particular domain or personalized to the learner’s specific needs. Classrooms allowed for blending online materials with projects accompanied by instructors who could assist with real-world application. But online learning 2.0 doesn’t do this well. As a result the most critical metric for corporate online learning, ROI, suffers. The one-size fits all approach is unnecessarily time intensive, wasting money, and creating dissatisfied learners. Given the combination of access to information online and varying learner backgrounds, it’s a waste of time to force learners through video and other content regardless of initial skillset. Learners should be able to opt out of materials and choose the learning methods most efficient for them. Another key problem is the production-focused perspective that off-the-shelf Learning Management Systems foster. Much like PowerPoint, a Learning Management System, to its credit, allows for an easy way to think about and produce a course. Outline a course, create some scripts, shoot some video, upload related text and assessments, and watch the completion activity. Simple and straightforward. Still a lot of work, but it’s straightforward. But we’ve all been through PowerPoint meeting hell. So it’s not surprising that an easy to produce system has focused course creators on their process at the expense of the audience. While the off-the-shelf Learning Management System might have made things straightforward it hasn’t done much to reduce the cost of producing any given course and leaves fewer resources to innovate. With costs of creating a mediocre talking head course still ranging from $150,000 to $1 million each, organizations are essentially spending hundreds of thousands of dollars to build a Hyundai (sorry Hyundai, no offense). If you’re spending that much money you should get a Ferrari. Or that mediocre experience should at least cost a lot less. The $150,000 Hyundai effect is preventing organizations from funneling dollars into new and innovative ways of learning online. Lack of differentiation is another problem. For companies in the business of training other businesses, the implications for staying with run-of-the-mill talking head courses are obvious. Lack of brand and product differentiation, poor efficacy, uninspired learners when compared to competitors who are investing in next generation online learning. Less obvious might be the impact on internal training, especially around leadership, sales, and customer training. Antiquated learning systems mean there’s a direct impact on driving business results. And employees increasingly see training and development as a critical employment benefit. In an increasingly competitive job market, lack of innovative learning solutions puts organizations at a recruiting and retention disadvantage. But there are organizations today who are starting to figure out how to move beyond the talking head video, multiple-choice course. That’s where online learning 3.0 comes in.  So What Is Online Learning 3.0? Fundamentally it’s the end of courses that consist solely of video lectures and multiple-choice assessments. It’s an evolution to a student-centered world. It leverages advances in learning science and tools to make learning faster, more effective, more enjoyable, and applicable to a larger set of learning areas. It’s the end of systems where course production considerations trump learner experience. Hopefully it’s the end of wading through hours of boring videos and questions to learn something without really being able to apply it in the real world. Modern user experience design, similar to what folks are seeing in consumer web. Visually engaging overview, e.g. what am I going to learn, how am I doing, what’s next, etc. Personalized, allows learners to test out and navigate in a nonlinear fashion. A knowledge graph frame of reference, instead of a list of materials to get through. Human involvement at scale, for example online coaching or group collaboration. Engagement tools, e.g. gamification, mobile, social integration, etc. Visible and transportable credit for what’s been learned. Delivered in the context of lifelong learning programs. Heavy use of data to improve the learning experience and course material over time. You may be thinking to yourself “that’s great, but I can’t invest millions of dollars and years of development to get to the next generation. I can barely get the existing courses out”. Or “we just invested in a Learning Management System, we don’t want to upset things now”. However, wherever you are in the online learning evolution, it’s possible to create a plan that has immediate impact yet puts you on the path to online learning 3.0. Here are some practical tips to start down the path and make the journey less daunting. 1. Take A Learner’s Perspective. If you or your dad were the learner, what would make for an efficient and enjoyable experience? Think outside of the LMS box for a bit. What consumer experiences do you enjoy? Borrow from those. 2. Create A Strategic Roadmap. This is not a feature roadmap for the next 12 months. Instead it lays out how you want to position yourself against competitors or current state in the long term. What do you think the most effective learning solution in the future will look like? How would you prioritize critical new capabilities? 3. Change Your Near-Term Roadmap. Change it from a list of interesting features to one that connects the near-term to your long-term strategic roadmap through a series of iterations. You won’t be able to get fully complete clarity on the strategic roadmap or how to get there right now. But start getting a feel for learner and ROI impact of various approaches. LTI and other technologies are key enablers allowing organizations to move from cookie cutter courses to dynamic experiences. 6. Change The Learner Experience Right Now Leveraging APIs And Lightweight Companion Apps. It’s relatively easy to create a differentiating learner experience that leverages your existing off-the-shelf systems. 7. Get Serious About Data. Reporting is often an afterthought for online courses. But just like the best consumer web companies, the leading online learning organizations are using data to improve their systems rapidly and proving out their ROI models. 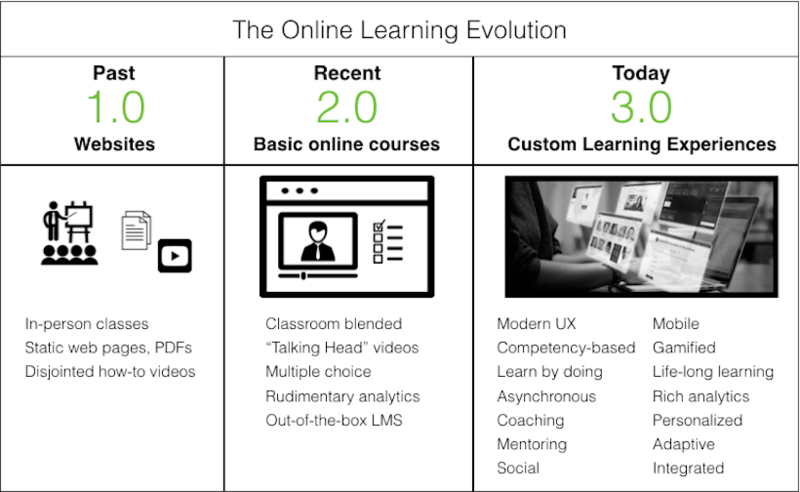 So where are you in the online learning evolution and how are you going to catch up?